To sign up to the Holiday Direction Newsletter and receive occasional brochure mailings', simply click the Request Newsletter button below and you will receive amazing special offers, discounts and inspiration on incredible holidays. View the Holiday Direction Online Brochure Now! Holiday Direction provide tailor-made holidays to give you the ultimate break from start to finish, from escorted tours in Cape Town to spa breaks in Mauritius. Sign up to receive the newsletter and also be included in time to time brochure mailings'. Take a South African safari and get in touch with majestic wildlife whilst you explore the best of Cape Town. Experience the Grand Tour of South America on an inspiring tour where you'll see the mountain-top city of Machu Picchu and the breathtaking Iguazu Falls! Take a break in the Canary Islands, formed by volcanic activity there's a story behind the beautiful beaches and bustling towns. Why not combine your trip with a visit to Barcelona, must-see landmarks include Barcelona Cathedral and the Gothic Quarter. Treat the kids to a family break in the Bahamas, you'll have a breathtaking backdrop as you enjoy activities like scuba diving and snorkelling. If you just want to relax then what better place to do so, the Bahamas has it all! 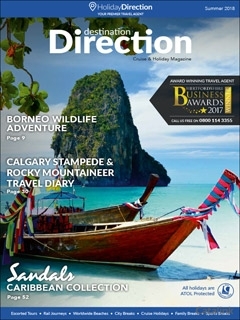 Sign up to the Holiday Direction newsletter today for inspiration on the trip of your lifetime! By Pressing the Request Newsletter button you give Holiday Direction (and their Data Processors for the specific purpose of delivering your emails) consent to send you their newsletter via email until such time as you choose to unsubscribe.